Systems integrators in the education field have long relied on Technomad for durable, high-quality PA systems for sports and live event venues. The combination of pristine audio (clear speech and musical reproduction), long-distance projection, broad dispersion, weatherproof design, ruggedness and quick setup have made the company a leader in loudspeaker and turnkey PA systems for high school and small-to-medium sized college stadiums. CESCO, a systems integration company based in Connecticut, has been specifying Technomad audio systems for a sizeable amount of its outdoor sports venue projects over the past five years. The company is well-versed in outdoor audio installations, with projects ranging from football, baseball and soccer fields to large-screen theatrical projections. Glazer and his team have had a busy year with Technomad installations in Connecticut, including two Technomad Berlin loudspeakers (the largest in the Technomad arsenal) at Salisbury High School for football, and two separate installations at the Wilton Athletic Field complex. The Wilton project includes two Berlins for a soccer field, in custom blue finish to match the high school colors; and three Nohos for a multi-purpose venue for sports including football and track and field. 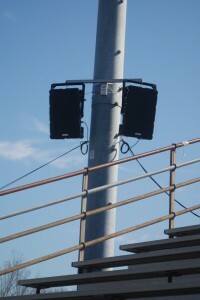 Glazer also recently installed three Nohos at East Hartford High School, with a loudspeaker at each side to cover the left and right bleachers, and a center loudspeaker darting straight across the field. Glazer added two amplifiers to produce different volumes for left/right and center, with the center speaker requiring more drive to cover the visitor bleachers. Glazer added that other recent projects include a football and track/field venue at SAGE Park in Berlin, Ct., (four Berlin loudspeakers), a football stadium at Cheshire High School (four Berlins) and Little League baseball fields in Old Lyme (Turnkey PA system with two Nohos) and Shelton (two Nohos). 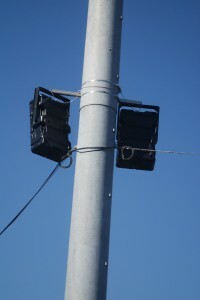 Glazer said that the Turnkey PA system at Old Lyme was an ideal choice because the signal processing rack can be removed from the announcer’s box and locked away after every game. In addition to weatherproof loudspeakers, Technomad Turnkey PA systems include a pre-wired amplifier, six-channel mixer, a dynamic microphone, cables, connectors and additional rack space in a 6RU shock-mount signal processing rack. Options include a wireless microphone and the Schedulon audio playback and recording system, which provides manual and automatic playback of stored, high-quality audio files. Glazer added that while the weatherproofing aspect is a significant selling point, the audio quality is what brings it all together.